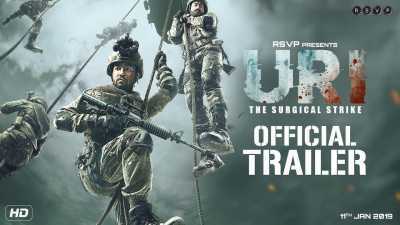 Uri: The Surgical Strike is a 2019 Indian action film written and directed by Aditya Dhar in his debut, and produced by Ronnie Screwvala under the banner of RSVP Movies. The film features Vicky Kaushal, Paresh Rawal, Mohit Raina and Yami Gautam in lead roles. A fictionalised account of the retaliation to the 2016 Uri attack, the film follows Major Vihaan Singh Sherghil of the Indian Army, who plays a leading role in organizing it. Uri was theatrically released on 11 January 2019. It received mostly positive reviews from critics and earned a total of 35.73 crore during its opening weekend.